Noel Gallagher has already begun recording his debut album without Oasis. Who gave the news was his friend Tom Meighan, lead singer of the band Kasabian, on Spanish media as his band is one of the attractions of the Festival Internacional de Benicassim at the end of the month. At first Tom was asked about a comment he made and which was on the cover of NME months ago. At the time, the singer said that with the end of Oasis, Kasabian were to become the biggest British band in activity. He said the meaning of that comment is related to the fact that they were the last band of our generation that preceded the internet, with the last "normal" audience. Tom said it's like being a fan of a football team: something we must feel, and cannot be described easily. About being the 'biggest band in England', it's because they are the last of the big bands of a generation. Times have changed and internet has changed the rock, but he followed his ways and always kept the principles, he explained. He was asked about the relationship between Kasabian and the Gallaghers, Tom said it's the best. They still have a contact and a good relationship (you've also seen Tom with a Pretty Green shirt and Kasabian @ Pretty Green party). 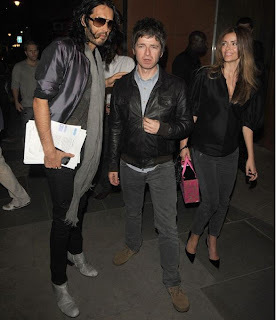 He talked with Noel last week, he said he's recording his album. They didn't see each other for some time, but Tom said it's always interesting when they meet, they speak of their life and, of course, about music. Tom admires Noel very much, he thinks the Gallaghers are fine folks. Oasis always gave great support to Kasabian, also six years ago they went on tour together, having a great time, going to parties, travelling across America. Tom said it was fantastic, and again Mani (Primal Scream) is another who gave them support, he said they are great people. last year in Manchester, Tom, Sergio Pizzorno, Kasabian & Oasis.